I'm starting to get nervous about my upcoming trip to New York to decorate cakes with Kelly Ripa for the Ovarian Cancer Research Fund. While Foodbuzz and Electrolux get all the details of the competition ironed out, I'm here at home, distracted and biting my nails. I don't know about you, but when this girl gets nervous, she goes...shopping. And so I thought I'd share with you a list of the top 10 cake decorating items I would most like to purchase right now. Keep in mind that my birthday is coming back around in seven months. Be prepared. #10 - Wilton's floral collection flower making set. This toolkit for making gum paste flowers looks like Play-Doh for grownups. I love the fact that it has cutters in the shape of every imaginable flower leaf and petal, including baby's breath, pansy, stephanotis (I don't even know what that is, but I'm sure it's beautiful on a cake), and several sizes each of daisies and roses. #9 - 12-piece gel paste food coloring kit from Cooking.com. There are 12 reasons why I want this: black, blue, yellow, green, pink, red, teal, orange, fuchsia, violet, sky blue and brown. #8 - Set of 24 mini pastel silicone baking cups from Williams-Sonoma. You don't even need a baking pan - these are sturdy enough to sit on a baking sheet by themselves. And when the mini-cupcakes are gone, the little liners go in the dishwasher. I'm in love. #7 - Gift cakelet pan from Williams-Sonoma. I'm not at all sure I'd be able to decorate these tiny little jewel boxes once they came out of the oven. The picture seems to show fondant and royal icing and maybe some gum paste flowers on top, and I'm not there yet. But can't I just pour some thin ganache over the top, throw on a few dragees, and call it a cake(let)? 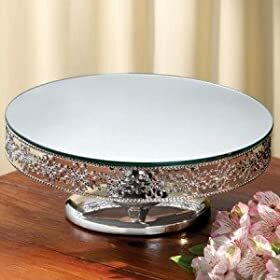 #6 - Mirror-top cake stand. This looks so fancy and festive - even the simplest decorated cake would look stunning on this stand. I have a small collection of cake stands, and I use them all the time, and not only for cakes. They're perfect for serving little nibbles at cocktail parties, or you can make small pizzas and serve them on a fancy stand like this to dress up dinner. #5 - Zebra-striped cupcake liners from Into the Oven. These speak for themselves. I also love the purple polka-dots. #4 - Wilton's triangle silicone baking cups. They're reusable, they're triangular, and they come in pink and purple. Somehow, the idea of triangular cupcakes appeals to me - very mod. #3 - Heart-shaped cupcake pan from Cooking.com. My husband, whom otherwise I adore, has this teeny tiny annoying habit of hating all holidays. Especially Valentine's Day. He knows I like it when he makes me feel like a princess on this day of hearts, so he goes through the motions, but I know he's doing it grudgingly. (He'd willingly do away with birthdays, anniversaries, Mother's Day, Father's Day, etc. as well.) But I'm a sucker for red and pink on Valentine's Day, and I'd love to make sweet little heart-shaped cupcakes in this pan. If I make them chocolate, I'm pretty sure he'll eat them. #2 - Pink 36-cupcake carrier from Cooking.com. If I'm going to go to all the trouble of making them and painstakingly decorating them, I want them to arrive at their destination intact. And #1 - The great cupcake cake pan from Williams-Sonoma. Okay, it's a little gimmicky - you bake the "cupcake" in two large pieces, top and bottom, and then stick them together with frosting when you're done. But it's so adorable! Thanks for making time to stop by, Shirley, and for the kind words! Yes, ovarian cancer is a big bad one, and I'm delighted to be able to do something to help, no matter how small. And to get to decorate cakes with Kelly Ripa in the meantime...it's all too thrilling! Just checking out what's going on in the She Writes food group and saw that you were going to meet with Kelly Ripa! Many congratulations, and for a great cause. Do you already have one of those cake stands that turns as you decorate it? I can't decorate a cake to save my life but I am convinced that if I had one of those they'd hire me over at the Cake Boss. I don't have anything to ask Kelly Ripa (thinking of another of your posts), but if you could confirm that she does not look that good without makeup and plastic surgery I would be very grateful. @lindsay: Got time in the next few weeks to come down here and give me a cupcake-decorating tutorial? @Cathelou: I do not have a rotating cake stand, in part because I'm not sure where I'd keep it. I'm sure there is some cosmic rhythm to the squeeze, swoosh, turn, squeeze, swoosh, turn, but so far it is eluding me. As for what Kelly Ripa looks like, all I've heard so far is that she's teeny-tiny. We'll see.